In the 1980s Teller began a strong campaign for what was later called the Strategic Defense Initiative (SDI) derided by critics as "Star Wars" the concept of using ground and satellite-based lasers particle beams and missiles to destroy incoming Soviet ICBMs. Whatever the actual components of the so-called Teller–Ulam design and the respective contributions of those who worked on it after it was proposed it was immediately seen by the scientists working on the project as the answer which had been so long sought. " Teller suffered a heart attack in 1979 which he blamed on Jane Fonda; after the Three Mile Island accident the actress outspokenly lobbied against nuclear power while promoting her latest movie The China Syndrome (a movie depicting a nuclear accident which coincidentally was released only a little over a week before the actual incident. He continued to find support from the U. 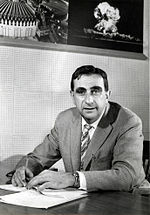 In 1953 along with Nicholas Metropolis and Marshall Rosenbluth Teller co-authored a paper which is a standard starting point for the applications of the Monte Carlo method to statistical mechanics.